In honor of July 4th this year, we decided to explore the origins of one of the most recognizable U.S. national emblems — the Bald Eagle. Excerpted from our Pennsylvania Newspaper Collection was this page featuring the Bald Eagle, from The Gettysburg Times, June 12, 1982. While the symbol is ubiquitous and quite recognizable, it can be found on currency, both bills and coins, an official U.S. passport, as well as numerous government buildings, the story of its origins is less well known. On July 4th, 1776, after independence was declared, the Continental Congress established a committee to create a national emblem for the newly founded United States of America. After several failed designs and 6 years later, on June 20,1782, the Continental Congress approved this Bald Eagle symbol created by the Secretary of the Continental Congress, Charles Thomson. In addition to creating the Bald Eagle symbol, Thomson along with John Hancock were the signers of the original Declaration of Independence, depicted on the back of the $2 bill. As his final act as the Secretary of the Continental Congress, Thomson was chosen to notify George Washington that he had been elected President. Through our genealogy platform, we were able to find and locate Charles Thomson’s 6th great grand nephew, Michael Thomson. Upon learning of his genealogy and relationship to Charles Thomson, he expressed that he is truly honored to be a descendant and plans to take this July 4th holiday as an opportunity to reflect on what Charles Thomson has contributed to the country. Are you a descendant of a revolutionary? What will you research in the U.S. newspaper collection? 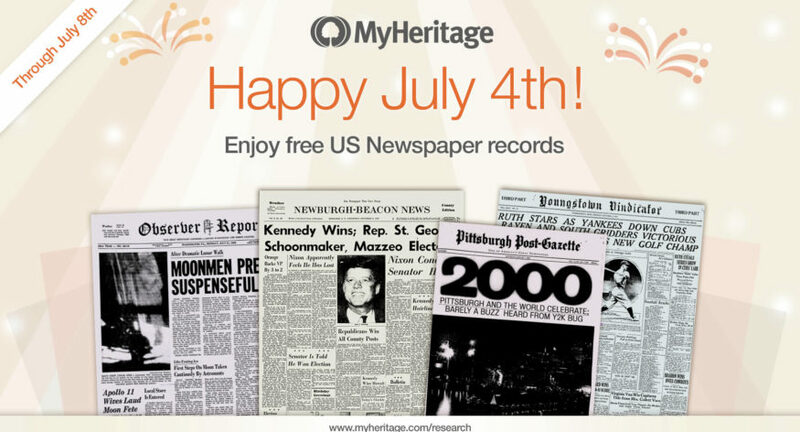 This holiday weekend, take advantage of the FREE access to the U.S. newspaper collection in SuperSearch™ and share what you find in the comments below!